Two near-clones of consecutive generation Porsches, specifically modified for different people and different occasions. Both share a stellar air-cooled soundtrack, and both have the perfect proportions to make any gearhead salivate. Both these Porsche RS clones serve an undeniably strong cocktail. In the red 964 clone, owned by a man named "Sleepy," whose 996 "GT3" we've admired in the past, we've got a slightly softer car. Though stripped and trimmed, this RS clone isn't the most focused of track cars, and clearly offers a more road-oriented setup. However, the gearbox linkages, bushings, engine mounts are racier, and the engine benefits from a Specialized Performance Induction kit, better injectors, and a Cup-spec Cam—all of which amount to roughly 300 horsepower. To help liven up the powerplant, Sleepy added a 993's six-speed with better ratios. The 964's tidy engine bay. The 993 is closer to true RS spec, and that focus is obvious from the outside. 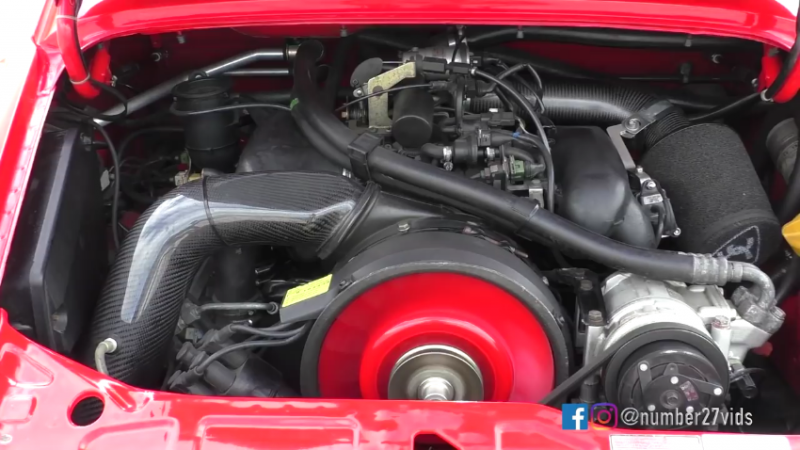 The engine uses a Ninemeister top-end, as well as a hotter cam. This particular beauty is almost to RS spec, but the shell hasn't been seam-welded, the rear calipers aren't RS, and the gearbox lacks the RS ratios. However, suspension, bushings, etc. are all RS specification—and the rawness and urgency of this focused Porsche is palpable. The 964 does have sultry lines, a classic bark, and a few modifications to make it just a hair sharper. Yet, it's not quite the track scalpel that the 993 is. That said, it's still a lovely car for backroad blitzes, and offers a great ambiance. With the Dansk exhaust filling the cabin, the perfect shift throw, and those understated Recaro Pole Positions make the interior a place lovely enough for a long haul. Bilstein PSS10 give some ride control, but the Porsche looks far from rock hard; gently riding bumps with poise. The 993 RS clone tends to understeer at the limit, but at least its a 911 that's manageable and stable in longer corners, where the steering livens up and replaces an almost disconcertingly light feel. Maybe it's the better of the two on public roads. Even their stances suggest wildly different characters. Even before driving the car, the 993's true nature is betrayed by the rollcage and its ride height. While the ride picks out bumps hardly noticeable from viewing the video, the body control and the obvious limited rebound mean a more involving drive and a sharper front. It's obviously a harder Porsche for someone who's interested in manipulating a car at the limit—and willing to put up with the incessant brake shriek. Which would you rather drive on a daily basis?